University of Rochester Press, 2012. These two books approach tenor Jussi Björling in widely divergent ways. Stephen Hastings has written a book devoted to his recorded legacy, exhaustive and analytical. Yrsa Stenius is a journalist whose book was first published in 2002 and now appears here in this limited edition printed edition in English in 2012. Hastings has been the Milan correspondent of Opera News for over two decades and editor in chief of the Italian periodical Musica for 12 years. Both his experience of the surviving discography and the clarity with which he approaches it are remarkable. In terms of the vocal art his book is in the lineage of John Steane’s The Grand Tradition, Michael Scott’s The Record of Singing and Paul Jackson’s painstaking analyses of Metropolitan opera broadcasts. The difference of course is that Hastings concentrates on a single singer. Here he comes much closer to the kind of studies written by Henry Roth on violin recordings and even closer to Mortimer Frank’s book on Toscanini’s NBC years, and John Ardoin’s study of Furtwängler’s recordings. Hastings sits closer to Ardoin, I feel, in his scrupulous analysis and sifting. The wealth and depth of analysis is inspiring. It’s also not at all dry. One thing it’s important to make clear at the outset is that this book isn’t a discography. For that you need Harald Henrysson’s A Jussi Björling Phonography, the second edition of which was published in 1993. It’s also not a biography though clearly there is a biographical element at work; for the biography there is nothing better than Jussi by Andrew Farkas and Anna-Lisa Bjorling, Jussi’s widow. Since, negatively, I’ve noted what it isn’t, it’s time to say what it is. In nearly 400 pages of text (up to page 352) and notes Hastings provides composer by composer analyses of the entirety of the tenor’s recordings, with the exception of the dance music records he made under the name of Erik Odde. There is a discography of his ‘remaining recordings’, which are lighter ballad material such as For You Alone, Tosti and traditional songs to which he devotes a few pages of analysis. To give you some indication of the range of the main body of the book, there are 16 pages on Gounod’s Faust alone, and a similar amount devoted to Romeo and Juliet. Yet whilst this is perfectly sufficient to cover in detail, and with considerable supporting critical apparatus Björling various performances or surviving arias, this is dwarfed by the two great Italian blocks of Puccini and Verdi. Pages 122 to 199 alone are devoted to Verdi, and ninety pages (pages 238 to 328) to Verdi. Thus nearly half of the text is devoted, properly, to the two composers with whom he was majorly associated, and of whose performances a huge amount can be said. 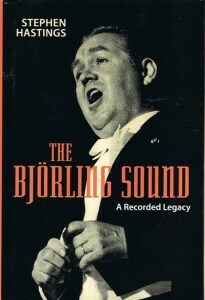 Hastings compares and contrasts Björling with other eminent singers. His superlatives are judiciously employed and mercifully they are not omnipresent. He contents himself when discussing the Missa Solemnis with the comment that ‘only a handful of the thirty-nine recordings of full-scale operas and religious works with Björling can be considered close to definitive in their all-round excellence’ but that this one is of that handful. The coolly measured nature of the comment is not Olympian but it is rooted in a series of value and aesthetic-musical judgements that one can follow or, if one so chooses, dissent from. I doubt though whether there will be much dissent given the encyclopaedic nature of the analysis and its closely argued commentary. Stephen Hastings makes a good case in favour of Björling the lieder singer. This is an area of his art that has not been as fully explored as it might, and the ten Schubert lieder that survive are persuasively advanced as important documents. Then, too, one notices what is not here: how shocking to see how little Mozart has survived; just two arias, both obvious ones from The Magic Flute and Don Giovanni; and this of an opera composer whose music the tenor is on record as saying ‘suits me best’. There is a discography of recordings cited in their CD incarnations-thus the need for Henrysson which this book could hardly replicate in that respect, in addition to the text. If you need to dip in, I suggest you bypass the big swathes of operatic literature and content yourself with the passages on Hugo Alfvén. There are only four surviving songs, one in multiple performances. You will find Hastings’s writing judicious, clear, technically elucidatory, and studded with relevant and apposite background material. You will, thus, find your perceptions and appreciation widened and will go back to the recordings inquisitive to see if your own view tallies with Hastings’s own. This, surely, is the essence of great criticism. 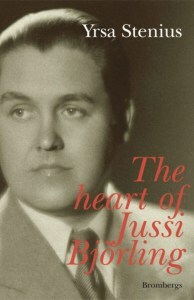 Criticism is not something that is absent from the other book under review, Yrsa Stenius’s The heart of Jussi Björling. By her account his heart was in his liver. I have seldom read a book, short of biographies of Dylan Thomas and Scott Fitzgerald, in which the subject’s alcoholic intake is more addressed. Did Björling drink more than Malcolm Lowry: is that possible? This chatty, informal unedited version in English of a book first published in Swedish in 2002 sits at the far side of Björling Studies from Hastings’s magisterial work. It involves reported speech and journalistic speculations, some naive circumlocutions and addresses to the reader. The florid style is matched by imprecision. Her rather all-purpose comments on the tenor’s Italian pronunciation are undone by Hastings’s specificities. Stylistically, and this example is not wholly atypical, it’s surely impermissible to write the following and to retain the confidence of a reader: ‘I’m trying to get a sighting of him in the viewfinder of my psychological binoculars’. So, yes, there are comments on his child born out of wedlock, as it’s rather charmingly called. There is an interesting passage on the confluence of language and confidence, on how tongue tied and insecure he was, on his increasingly serious medical ailments, the arrhythmia and the depression. The passages where he is scared to perform, scared to be the ‘Jussi Björling’ he felt unworthy of being, may well be lucidly based on truth. But there really is too much about his alcoholism, and too little penetrating analysis. For a serious biography you need Farkas/Björling.